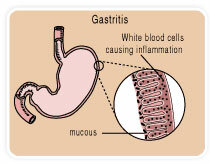 In many cases gastritis develops in patients who had undergone some surgery, infections, burns and traumatic injury. Gastritis also develops in those persons who have a surgery for weight loss that result in digestive tract reconstruction. A gastritis symptom follows abdominal pain, discomfort, vomiting and nausea. Doctors usually carry on gastritis diagnosis based on gastritis symptoms in patient using endoscopy. A gastritis treatment need drug to reduce the stomach’s acid causing irritation in stomach.